What would a former Gitmo detainee, a journalist in a small central Asian newspaper and an editor of a big Western publication have in common? They are provided with documents from WikiLeaks about politics in the region, but what will they do with them? For a former Gitmo detainee, the documents reveal a bit about why he was captured – for knowing more about the movements of refugees in the area, information that he says “everybody knows.” But for editors in Central Asian capitals, WikiLeaks files are a hot potato. The documentary film dates back to 2011, when WikiLeaks activists were just starting to realize the power of the leaked US cables they had received from whistleblower Bradley (Chelsea) Manning. 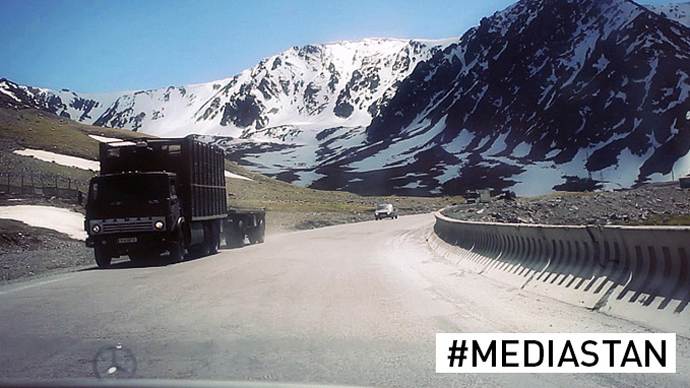 In “Mediastan,” produced by Julian Assange, Rebecca O'Brien and Lauren Dark, a group of underground journalists test the impact of the leaked documents as they travel through Central Asia in search of local media outlets willing to publish Cablegate files. Their journey follows the ancient Silk Road traversing Kazakhstan, Kyrgyzstan, Tajikistan, Turkmenistan, Uzbekistan and US-occupied Afghanistan. The team of five WikiLeaks supporters, led by Johannes Wahlstrom, meets with a number of local news organizations and offer them classified files, but are consistently greeted with media censorship from local governments and corporations. Their first destination takes them to AsiaPlus newspaper in Tajikistan and provides an insight into the pressures exerted on the region by the West. When presented with the idea of publishing the leaks, AsiaPlus Editor-in-Chief, Marat Mamadshoev, nervously jokes: "We'd rather get approval from our superior first... the Washington DC overlord of Asia Plus!" The second part of the journey takes journalists to the republic of Kyrgyzstan, where the US has rented a military base near to the capital since 2001. The Wikileaks team has documents showing secret details of the deal between Bishkek and Washington about the base, but getting the local branch of Radio Liberty, sponsored by the US government, interested in the story proves to be a challenge. The film’s director, Johannes Wahlstrom, told RT that the release of Mediastan is an “acid test” to discern where the allegiances of the media lie. “Compared to what we were used to, we were surprised at how honest the Central Asian journalists were in describing their censorship and limitations,” he said. “It is often easier to see the limitations and imperfections of someone else or a country elsewhere than it is to look at oneself and one's own surroundings,” Wahlstrom told RT. The third part of the film moves from Central Asia to Britain and the US, with new cables being shown to The Guardian and The New York Times. Julian Assange talks to The Guardian’s editor, Alan Rusbridger, about how the newspaper censored US cables about rich kleptocrats and western oil companies. In New York, the NYT’s editor, Bill Keller, reveals his newspaper’s daily telephone calls with the US government. "Mediastan is not so much a physical place as it is a state of mind among many of the journalists and editors who form our perceptions of the world," Wahlstrom said. The film is a challenge to Hollywood’s ‘Fifth Estate’ which was condemned by WikiLeaks as a “propaganda attack.”However, Wahlstrom accepted that the film’s “flop” had actually worked in WikiLeaks’ favor. “The success of Mediastan, on the other hand, has a lot to do with the Hollywood story, since we have been able to use their marketing to our advantage,” Wahlstrom said. The journey was not an easy one, he adds. “Throughout our journey we were tailed, or at least we thought we were being tailed, by various state agents. But it seemed as though they didn’t consider us a serious threat since they had other ways of controling their own media if we were to hand them the documents,” he said. The film was previously made available over the internet but has not yet been released to cinemas. RT received the right to broadcast the film along with a number of other news outlets. “RT proves that it is the largest international TV station in the world that will not shun from the topics of Mediastan,” said Wahlstrom when asked why the film had been released to RT.